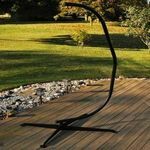 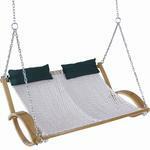 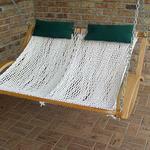 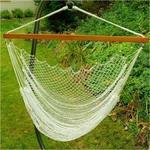 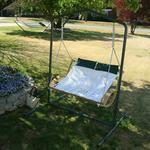 Original Double Polyester Rope Sling Rocker The Original Double Polyester Rope Swing provides relaxation for indoors or out. 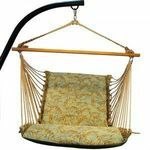 Crafted in a 100 year tradition, it features quality materials in a comfortable sling seat design. 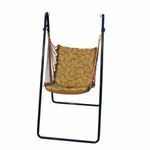 This hammock-style rocker is made of white handwoven polyester rope, curved oak supports with a protective outdoor varnish coating. 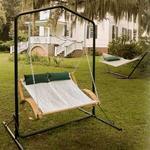 It also comes with hunter green head cushions.